Maybe your pre-kid memories of trips to New Orleans are enveloped in a bit of a boozy haze (we don't judge). 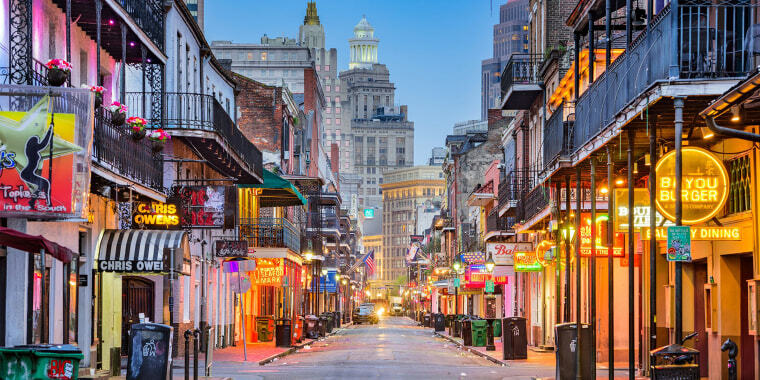 But you'll be happy to know that the Big Easy's friendly, welcoming atmosphere also makes it a worthwhile spot for a family vacation. Got a kid obsessed with transportation? There are plenty of new modes to explore, like steamboats, street cars and horse-drawn carriages. The family-run Louisiana Tour Company offers Barataria Swamp boat trips, piloted by locals who grew up in these parts and have great stories to tell. You'll sail past a 2,000-year–old Native American burial mound, a Cajun cemetery and a fishing village, keeping an eye out for wildlife like alligators, turtles, osprey and brown pelicans. Take older children to the Whitney Plantation, about an hour west of the city in the town of Wallace. Unlike other plantation tours that focus on more on architecture or the slave owners' lives, the Whitney explores the past through perspective of the slaves who lived and worked at the estate. Along with the Big House and slave cabins, there are poignant sculptures of children throughout the property, as well as several memorials. Preservation Hall, a historic, no-frills performance space dedicated to the city's jazz tradition, hosts nightly all-ages shows beginning at 5 p.m. You'll see some of New Orleans' most talented musicians in an intimate, 45-minute show with lots of band-audience interaction. Line up early for tickets ($20, cash only) or reserve guaranteed "Big Shot" seats online and just arrive at showtime. The Royal Sonesta Hotel New Orleans might be on Bourbon Street in the heart of the French Quarter, but its pretty garden courtyard and pool make it feel like an oasis. Rooms that face the inside of the hotel tend to be quieter, and some of the more expensive ones have French doors that open onto wrought-iron balconies. The lobby of the Westin New Orleans Canal Place is on the 11th floor, so you know the hotel, which is right on the Mississippi River but still close to the French Quarter, is guaranteed to offer great views. For parents experiencing beignet regret, there are complimentary Lululemon-sponsored yoga classes and a New Balance workout-gear–lending program (so no excuses to skip the gym). Splashing in the rooftop pool is a great way to start and end each day, and if the Audubon Aquarium is on your itinerary, it's right across the street. The blazing retro concoction Bananas Foster was invented at Brennan's, so you already know what's for dessert. The menu mixes Creole influences with modern techniques and is heavy on regional seafood like gumbo, roasted oysters and blackened fish. Kids' meals come with sliced fruit, a drink and ice cream, and include entreés like ravioli, grilled cheese or fried gulf shrimp. If the little ones get antsy, bring them into the courtyard to check out the turtles sunning themselves in the pond. Kids and grown-ups live their best NOLA lives at The Backyard in Lakeview, where there are strong margaritas, flat-screen TVs showing sports, barbecue entreés like pulled pork and a robust selection of kids' combo meals. But what makes The Backyard just a little more special is its pleasant back lawn, where the owners have thoughtfully installed a small playground.